Dungannon Swifts move six points clear of the Premiership basement by beating Ballinamallard United 2-0 in Saturday's relegation showdown at Stangmore Park. 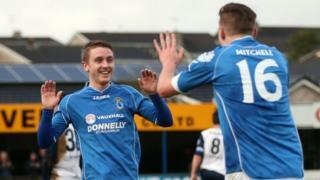 Goals from Alan Teggart and Ryan Harpur secured a victory which opened up a three-point gap to the Mallards. Dungannon boss Rodney McAree and Ballinamallard counterpart Whitey Anderson gave their post-match thoughts.